Views from the loch. : Slow Fishing on the Tweed! Slow Fishing on the Tweed! I could easily be referring to the Brown Trout season just gone on the loch for indeed it was a poor one, no question about it! However with our autumn day Salmon fishing coming up I thought I would enquire of the regular fishers on the beat and see what has been going on. It’s been really slow fishing up to this point with the Tweed not experiencing any real rain enough to lift the height and remove the debris from the bottom. Such increases in height are the trigger that tells Salmon in the estuary that the water will be of sufficient height to allow easy passage to their spawning grounds. The fishing so far this year has been very poor along the lines of the previous year which was one of the worst in the Tweeds history. Catches have been very poor and quite simply many anglers have not even bothered to come which of course is not good news for the businesses that rely on the anglers who come to the area for the fishing. Many beats are now praying that the recent rain brings up a good head of fish and certainly a few watchers have reported seeing large numbers of fresh fish on the move, the questions are how many have come and will they hang around and oblige anglers. The answer of course will come this coming week so we will just have to wait and see! The fishing this year has not lived up to expectations with rods still to let on many prime beats and at this time it is usual that a king’s ransom would not have got you a day at this time in November! There are many theories as to why for the second season in a row the fishing has been so poor. They range from over predation by saw billed ducks and seals to illegal commercial fishing at sea. 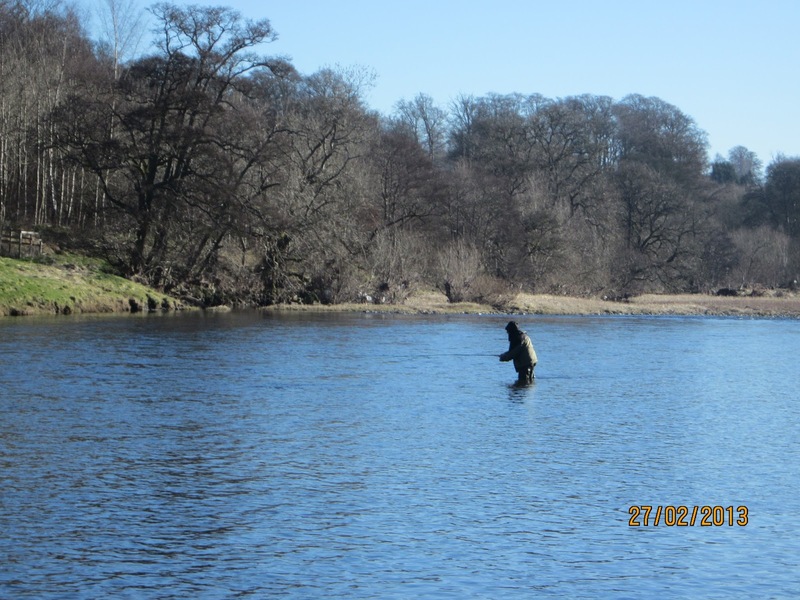 There is at this time no proven reason as to why the fishing is poor with some rivers such as the Spey having had a reasonable season. There is a need for further research to determine the cause because if the situation cannot be turned around the outlook for the area will be bleak indeed! If a cause is determined then the government must act swiftly and decisively to put right the situation. However in spite of this our party will head off and give of their best to try and tempt a fish using all sorts of different tackle and tactics! As always it will be a great day out but it would be nice to connect with a fish. River Tweed look out, here we come! Recently I spoke with our member Fraser Patterson and he is now venturing deep into the loch around 100ft down to try and connect with shoals of fish shown to be there by a recently acquired fish finder! It will be very interesting to see just what can be tempted from such a depth! During the search for Arctic Charr by Glasgow University Shoals of Perch were noted and netted at depths of 140ft! Although the netting survey revealed no Arctic Charr we always hope that there is a population somewhere in the depths and it is endeavours such as Fraser’s project that will add further clarity to the situation. It’s great having angler’s who are always pushing the boundaries and whatever they discover our knowledge of the loch will be much enhanced! You may be like me and don’t trust a Tory under any circumstances or you might fall into the oddball sector in Scotland that supports them whatever! I would never have believed that the House of Lords would condemn the Tories brutal policy on tax credits! Mulling over the reasons given by the Lords for stopping what was after all a policy not mandated by the British people was the fact that as usual the poorest in society must bear the brunt of the pain, and to their credit they stood by their decision! Minister without a clue Gideon Osborne was aware of the stramash that this policy was generating yet like the archetypal Tory said “he was comfortable on his position”! Financial analysts, charities and interest groups everywhere told him in no uncertain terms that the poorest would be hurt the most yet he still barged ahead! Some commenter’s are labelling this as another “Omnishambles” moment which yet again embarrasses the British people! Lord Snooty and Gideon Osborne are yet again left with egg on their faces as their policy unravels and believe me this will be the first of many as the ridiculous figure of 40% cuts to departmental budgets still to come will be unsustainable! It must now be clear to everyone that through bungling and downright incompetence we are heading in the wrong direction. Just what kind of government persistently punishes the poor when the wealth of the rich is ring fenced and untouched! The House of Lords did the right thing on Monday night and the message they sent was clear that the poor of the country cannot withstand any more punishment from the arrogant Tories who have no empathy with the poor many of who are now transformed into the working poor! The bill will come back in some form make no mistake, but it will be suitably modified to lessen the impact on the poor. The poor incidentally whose numbers are increasing rapidly under this administration. But let’s be frank the Tories will not change their spots, they will continue to dismantle all that we hold dear and further punish the poor! Our method of escaping this highly unsavoury situation is to seek independence but it must be done much more quickly, so come on the SNP and speed things up we desperately need to get out of this macabre circus! Photo 02 - No smoke free zone here! This week I will recount my efforts to return to the road my Kawasaki H1B Mach 3. I’ve owned this from new and this particular model was imported as a show bike for the 1973 Earls Court show and had double disc brakes fitted which was not standard issue for any of the triples at the time. Those familiar with this bike will know that when introduced in 1969 it caused an absolute storm, this was the fastest production bike that you could buy blowing 750s and bigger bikes into the weeds and was only toppled when Kawasaki brought out its big brother the 750 in 1972! 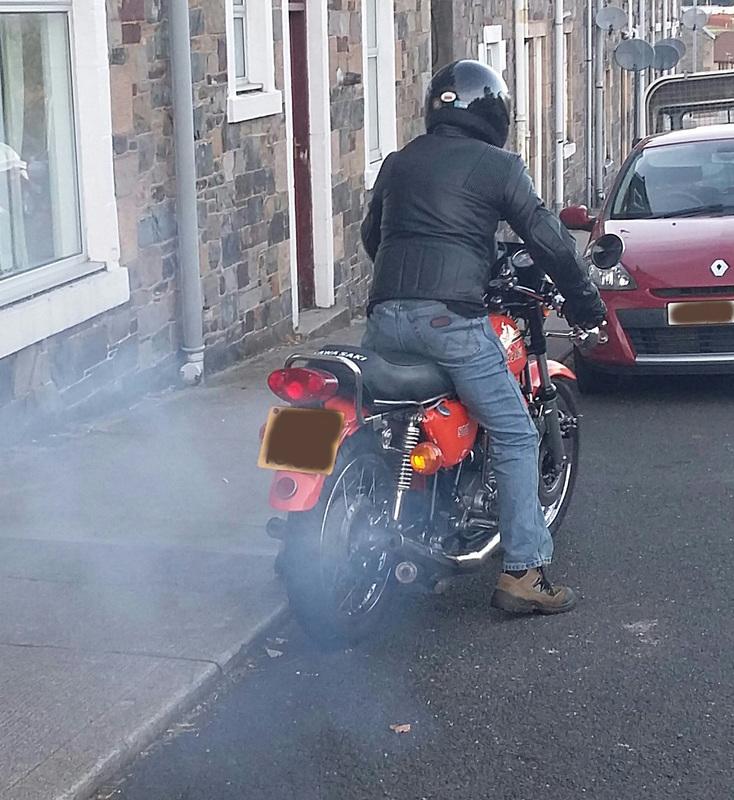 She accelerates like a rocket in a most hairy fashion as you would expect from a 498cc two stroke triple cylinder machine! There is no linear movement she needs high revs to take off and hitting five thousand revs she explodes and it’s possible to lift the front wheel in the first 3 gears so vicious is the power band! I found this out accidentally one day and Christ did I get a fright! Nicknamed the “original widow maker” because of the unpredictable handling best described as wacky! Yes she does not like braking in corners and can react violently bucking you off when confronted by pot holes! 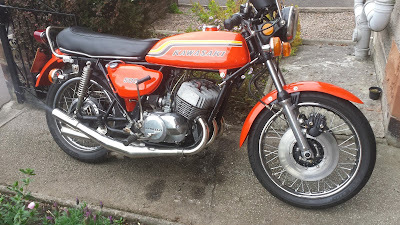 Her favourite tantrum is to shimmy the handlebars at higher speeds sometimes so violently that Kawasaki fitted a friction damper as well as a hydraulic one. In her day she would pass anything except a petrol pump and one magazine at the time got 14mpg high speed travelling! 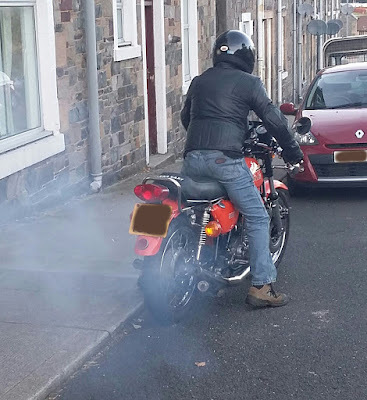 She drinks two stroke oil at the rate of about 130 miles per pint and blows out blue smoke in the most antisocial way leaving followers lost in a blue haze and breathing Castrol R! Now there was a reason for this and it was to over lubricate the centre cylinder which was prone to overheating and ultimately seizure. Photo 03 - The Mach 3 getting close to factory spec! She has been rebuilt (her third incarnation) but some problems are still apparent. She will not charge the battery in spite of having the rotor rewound the stator and wiring checked by professionals and a new British regulator/rectifier! She pours excess smoke from the right hand cylinder (see photo above) indicating the o rings in the oil pump have had it and need replaced. Of course none are available and since they are not circular rather a stretched circle it is not a case of simply buying the correct size of circular ring. The exhausts are aftermarket expansion chambers (crackle boxes) (Allspeeds) in place whilst the originals are being welded prior to re chroming and they emit an ear splitting note. The air box is being de rusted and painted and will replace the individual K&Ns when the original exhausts are fitted and that will be her pretty much restored to standard! Well the motorcycling season is drawing to a close for the year and she will be making her last journey of 2015 in the next few days to a place of safety to rest in slumber for the winter. She is a bad tempered evil witch but after 42 years we are still together, enough said! River Tweed here we come!